An 81-year-old woman was taken to hospital with head injuries after a fall in Selsey yesterday afternoon (Monday), Sussex Police has confirmed. Police and paramedics were called to Chichester Road, Selsey, after reports of a person lying in the road outside The Old Piggery Farm Shop. 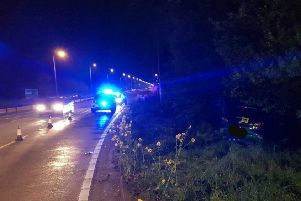 A police spokesman said: "At 5.43pm, police were called to Chichester Road near The Old Piggery where an 81-year-old local woman had sustained head injuries, apparently having lost her footing and fallen on uneven ground after crossing the road. "The woman was taken by ambulance to St Richard's Hospital, Chichester." A spokesman for the South East Coast Ambulance Service, which was called to the scene at 4.40pm, said the woman was 'assessed and treated' for a 'trauma injury' before being taken to hospital.